Not all of us are blessed (depending upon your point of view) with lots of land to grow vegetables at home and there may not be an allotment or community garden close to you. The UK has a great scheme called Landshare created in 2009 by River Cottage where people with land share it with those who don’t, now with over 74,900 members, but it’s not something that’s really taken off here in Ireland. You might have the space to grow your own food but not enough hours to spare, or you may feel it’s a bit of a waste of time when veg can be picked up so cheaply in supermarkets. We all have reasons for not growing our own food but if it’s something you’ve considered having a go at but haven’t yet begun, container gardening is a good way of starting. 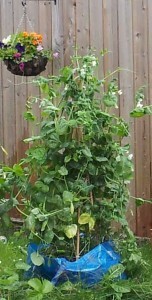 Aside from herbs, the very first vegetables I grew were in containers in the form of runner beans, garlic and carrots. Almost all vegetables can be grown in containers – as few or as many as suits your lifestyle and if they’re recycled pots, all the better. In fact if you’re new to growing veg, having planters around your door, window or balcony might be all that’s needed to get the veg growing bug. Once you’ve experienced the pleasures of harvesting your own food and eating it, who knows what’ll happen next! Start with reliable, quick-growing veg that you like to eat. Many varieties of seeds are bred to grow especially well in pots and containers, so keep an eye out for them as you’re more likely to receive good results from them. 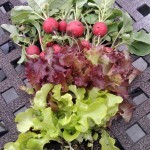 choose what you like to eat: rocket, radish or mixed lettuce, cherry tomatoes or baby carrots, peas or salad potatoes can easily be grown outside a sunny door. Bamboo or hazel canes can be decoratively tied in your container for growing mangetout, peas or runner beans. 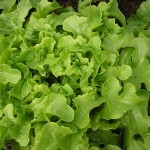 Look out for the label CCU (Cut and Come Again), more common with varieties of lettuce. This means you can take a few leaves off each plant when you need them and not harvesting the plant. Many of the vegetables suggested in the post “growing vegetables in small gardens” are also suitable for container vegetables gardens. A quick tip: the smaller the container, the quicker the compost will dry out, so as much fun as some of the quirky containers are that we see on Pinterest, unless you can make sure your plants will get a good water every day, try to stick to large containers. 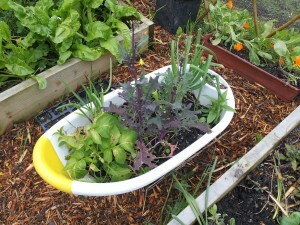 Old tyres, baths, toilets and sinks have all been used to grow plants in. Thick plastic ‘laundry bags’ are great for growing potatoes, or brush up on your woodwork skills and you could also have a go at making your own window boxes and planters too – pallets are ideal for this purpose. Lack of drainage can cause as many problems as lack of water. Water must be able to escape in whatever you’re using so it’s important to make sure there are holes in the container that you’ve chosen to plant vegetables in. Most shop bought containers already have holes in them, or marks where you can punch the holes out. If you’re making do, you may need to make holes in your bag or container near the base (a masonry drill set at slow speed will work on earthenware, place tape on the surface before drilling). Once you have holes in your container you can add ‘crocks’ to the base. We save all our broken cups, mugs and plates for this purpose, and are often reminded of old favourites when we clean them out again. 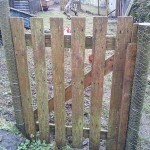 If you haven’t got anything broken to hand, a layer of washed gravel or chippings works well. Placing crocks over the holes will stop the compost from blocking the hole, and if you’re lucky enough to have some zinc mesh that you can cut to size, this can be placed over the holes and then the crocks added, which will help to prevent pests burrowing back into your pots. In the past I’ve successfully grown vegetables in multipurpose compost and grow bags but being ‘soiless’ and peat based they dry out quickly and as highlighted by Gardeners World, contribute significantly to global warming. 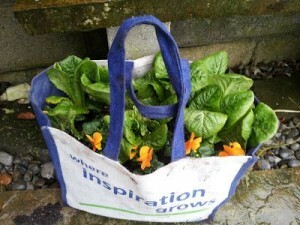 Peat free organic alternatives are now a readily available alternative which work well in containers. 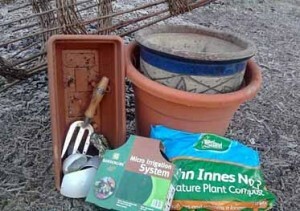 Many gardeners swear by potting mixes that are John Innes based. These have been devised at the The John Innes Centre and each have different component mixes. They’re loam (soil) based with different quantities of loam, limestone and peat, depending upon their usage. So, for example, John Innes Seed Compost is for growing seedlings, and John Innes No 1 more suitable for slow-growing plants or tiny spring seedlings. No 2 is the general multi-purpose compost but No 3, a stronger mix, would be ideal for strong growers such as tomatoes, or sweet peas. Whichever potting mix you choose or is available to you, it’s important that its fresh and disease free. Buy your compost from a supplier that has a fast turnover and when you get it home, once opened it’s recommended to store it in a plastic bag in a frost-free place. Always use fresh compost for seedlings, or they can suffer a disease called damping off (where they just flop over and die). 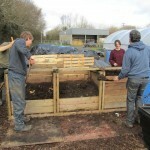 Why use compost and not garden soil? Garden soil will vary in its pH (acidity/alkalinity), is likely to contain weed seeds, may container disease spores and will vary in its nutrient levels. Container plants will need regular watering, and if it’s a particularly hot summer that could mean up to twice a day. There are a few things you can do to ease this burden. Set up an irrigation system. Simple drip feed irrigation kits are now readily available, and getting cheaper every year. Look out for window boxes that contain built-in reservoirs. Stand plants on trays lined with capillary mats or wet sand. Generally, potting mixture has enough nutrients to last a few months. However if you notice a check in growth, or you’ve planted particularly ‘hungry’ feeders in your containers, liquid seaweed is full of nutrients and trace elements and can be watered into the soil in the containers as can home-made nettle or comfrey feeds. Most vegetables like to grow in a sunny spot. The garden highlighted in these photos in the centre of Carlow town is a little sun trap and everything grows really well here. The great thing about container gardening is that you can move the pots to the sunniest place and leave them there – you’re not constricted in the same way you might be with a garden. We have a cat who LOVES to sleep in containers full of lovely, warm compost, not caring a hoot whether it has tiny little carrot seedlings growing in it! If you’ve noticed cats around your containers or beds, this post here is full of tips that might help to keep cats away. Slugs and snails find containers attractive too. Here’s 15 ways of dealing with them organically. Another tip I heard is to smear your containers with Vaseline which apparently makes them too slippery to climb! 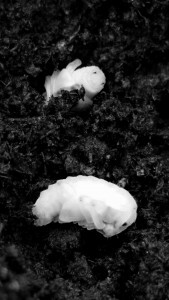 Just like garden soil grown vegetables, container veg can be attractive to various pests such as strawberry or vine weevils, chafer grubs and leather jackets. Supernemos are an Irish business that have developed a biological control that are able to deal effectively with them. They might seem a little pricey but believe me, if you’ve ever lost your entire strawberry crop to this little weevil, you’ll find Supernemos worth every cent. 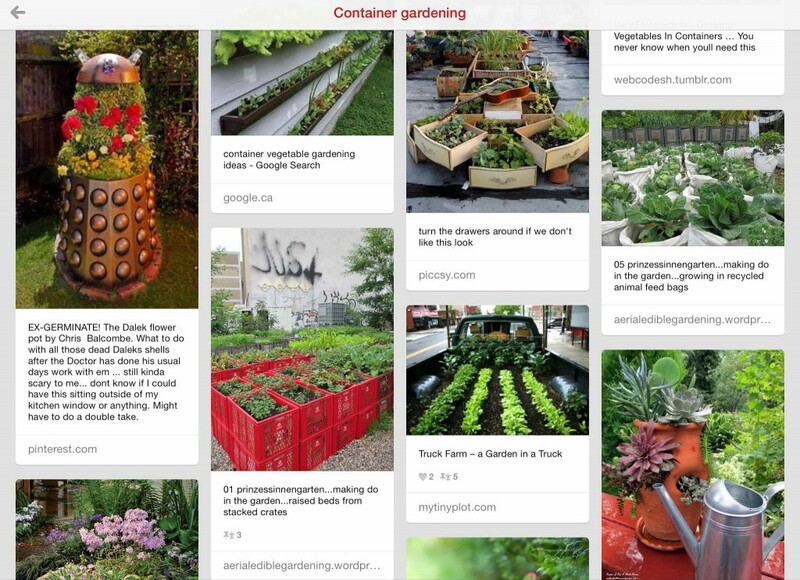 If you’d like some more ideas on container gardening, check out the Greenside Up Pinterest board here. 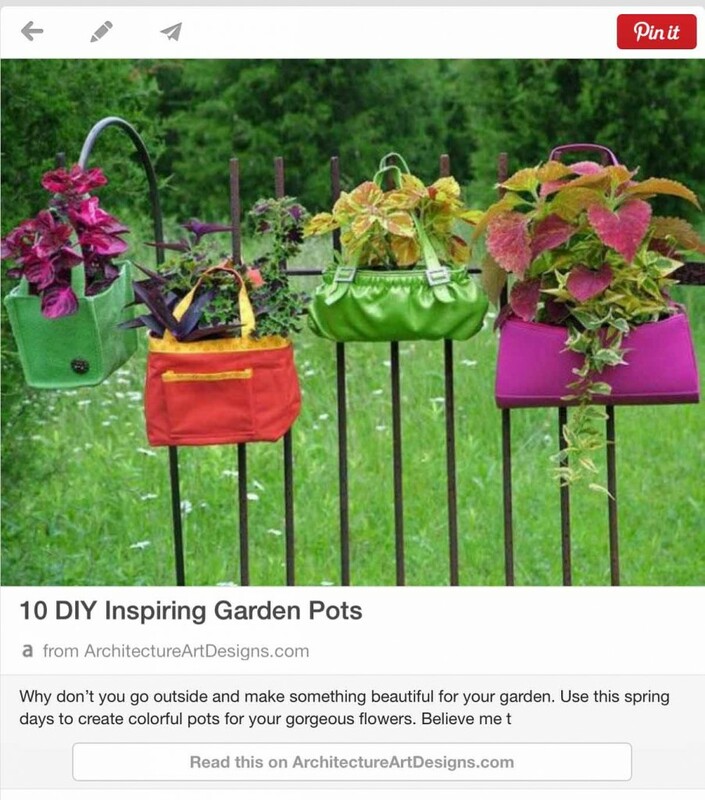 There’s also a board sharing some ideas for a recycled garden that you might like to look at. 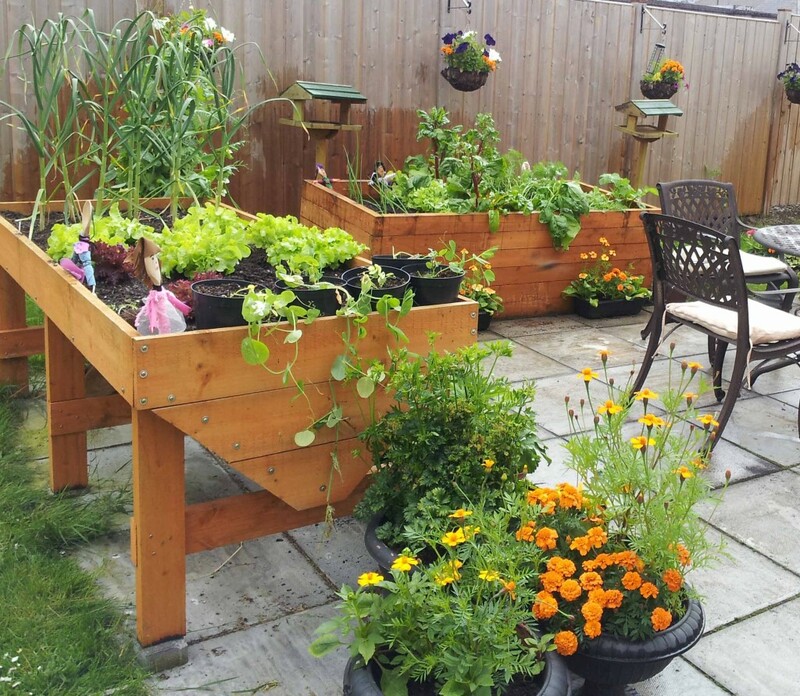 Have you had any experience growing vegetables in containers? Any tips you’d like to share? 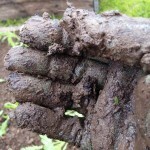 Guest Post: Organic Mulch ~ What’s that all about? There are endless possibilities in the world of small container, and vertical gardening. I have a small tract of land in the South and have been researching online for ideas how to make the most of the small space I have. So many ideas I can’t decide! Those old purses are such a neat and colorful idea, thank you for sharing these! You’re welcome Dedra. Other than a pallet wall, I’ve yet to venture into vertical growing but am hoping my new group will come up with something that we can try! Some great tips here,Dee. Thanks. Thanks Cathy, appreciate you stopping by to comment. Hope your veg coming along well this spring. Yes, I’m wondering where they found it and I do like to hear about plans to get out in the garden. Looking forward to hearing all about it. Thank you so much for this post. This answers all my questions. My plan is to start a container garden this year. I had gathered all kind of information/inspiration on a Pinterest board but didn’t know where to start. This is so useful! Ahh that’s great, thanks, looking forward to reading it!